Conversations were thought to have come about during the late 1770's, when these sweet little tarts were created to celebrate the publication of Madame d'Epinary's book, 'Emilie's Conversations'. Served at a function touting quite the attendance list, rumour has it that the small pastry cross was placed atop the tarts to remind guests that they would be mingling with many a great mind, thus encouraging them to 'cross swords' by way of free and lively discussion. Whatever the reasoning, these indulgent little tarts are a wonderful invention that falls pleasantly in between being a decadent afternoon treat and a comforting, yet impressive, dessert. Reminiscent of Britain's classic Bakewell tart, conversations comprise a flaky pastry crust filled with a dollop of tart jam and rich layer of almond frangipane. They differ, however, in the addition of a thin pastry top brushed with royal icing, which, once baked, adds a gorgeous meringue-like crunch to help contrast the rich buttery filling. Definitely worth locking those intellectual horns for. Combine all the dry ingredients together in a medium bowl. Rub in the butter until it resembles a rough crumble and then add the water and combine to a sticky dough. Press into a disc, wrap in cling film and refrigerate for a minimum of two hours. Cream together the butter and sugar, then gradually add the eggs, vanilla and lemon zest. Beat in the flour and meal and then refrigerate until ready to use. Sift the sugar into a small bowl and then gradually add the juice and egg white, stirring until you have a thick paste. 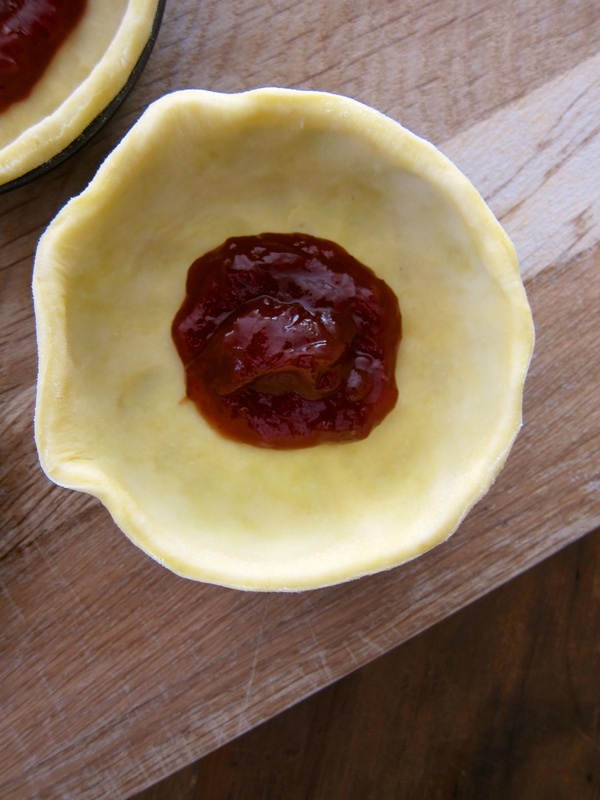 Preheat the oven to 215°C and grease six individual 8-cm tart tins. On a lightly-floured surface roll the pastry until 2-mm thick and use a 11-cm cutter to cut out 12 rounds. Cut thin strips from the leftover pastry. Use half the pastry circles to line the tart tins, leaving a bit of overhang at the top of each case. Place a teaspoon of raspberry jam (or jam of your choice) in the bottom of each tart shell and then spoon or pipe the frangipane in to just below the top of the case. 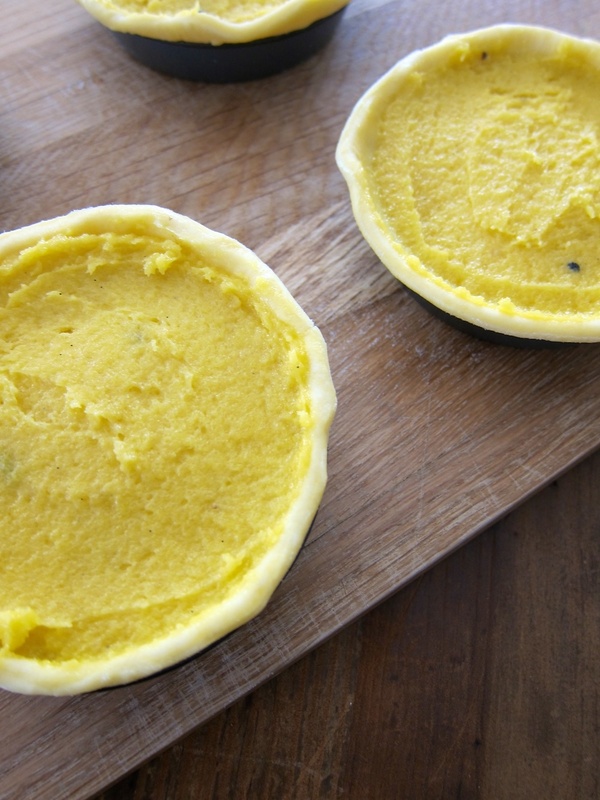 Place the remaining discs on top of each tart and press down to seal the edges. Trim any excess pastry and refrigerate the tarts for at least 1 hour. Once chilled, spread a thin layer of royal icing across the top of each tart and clean the edges so that there is no icing on the rim. Decorate with thin strips of pastry and then place in the oven. Immediately reduce the temperature to 175°C and bake for 35-40 minutes, until golden brown. Transfer to a cooling rack, easing the tarts out of their tins while still warm.